"I'd like to have my son assessed for autism or to, at least, rule it out," I tell my family doctor. She agrees to put in the referral and casually mentions to me that it may take a few months. It was a vague response. However, I would soon learn that those few months would actually mean 12-18 months until the actual assessment and would include months of enduring wait list after wait list. I didn't want to just wait it out for those 12-18 months. My son needed help. And, whether I wanted to admit it or not, I needed help. I started researching practical strategies that we could try while we waited for the diagnosis and started implementing anything we could think of. Some strategies worked flawlessly, while others failed miserably. And soon we would have an entire arsenal of tools at our disposal. 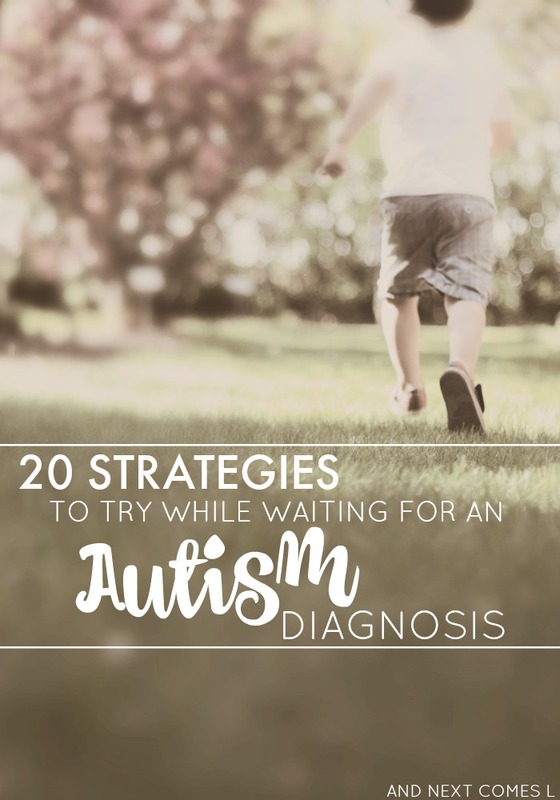 So if you find yourself waiting to have your child diagnosed with autism, or even sensory processing disorder, then these 20 strategies may be just what you need in order to get more good days and less bad days. They may be just the strategies you need to fill the gap until you can get professional help and services for your child. 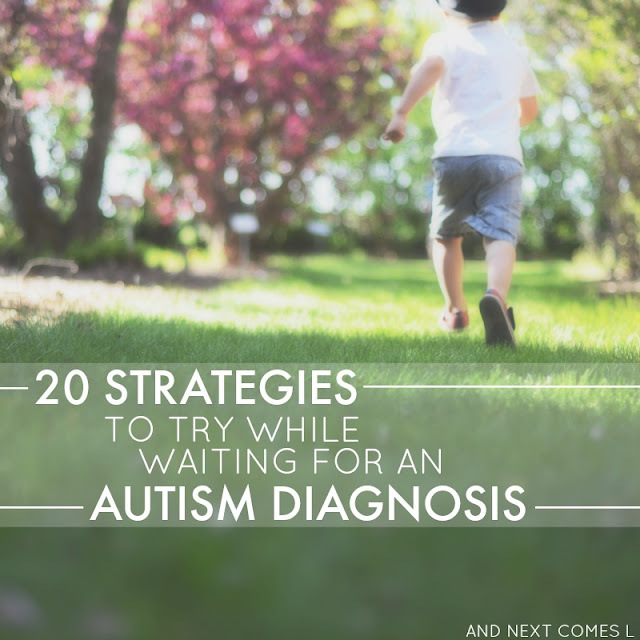 These strategies are also great to maintain even after you receive your child's diagnosis and they are by no means an exhaustive list of strategies to try. 1. Start a daily visual schedule to establish a routine. Our free printable visual schedule is great for helping kids who struggle with transitions. 3. Make an OT at home jar. It's a quick and easy way to sneak in the sensory activities your child needs throughout the day. Not sure what to put in your jar? These 50 heavy work suggestions would be a great place to start! 4. Find a support group, either local or online. Here's a list of Facebook support groups for special needs parents. 5. Have a child who bites or hit others? Try this easy high five idea as a substitution or try out one of these oral motor activities to reduce the biting behavior. 6. Write a social story for something that you child is currently struggling with (here's an example). I love these tips for writing your own social stories. 8. Start keeping track of your child's weekly speech, OT, and sensory goals with the free weekly autism planner. So even if you don't have a diagnosis yet, you can still write down goals that you would like to work on with your child. 9. Invest in some essential oils and start incorporating them into your day. Here's a list of the best essential oils for autism. Once you have your essential oils, make this calm and focused essential blend and use it every morning. 10. Start doing a weekly detox bath as a way to increase concentration and promote relaxation and sleep. 12. Make a calm down bin or anti-anxiety kit. 13. Install swing hooks in your house and start making swings part of your child's daily routine. See how our swing hooks are installed here. 15. Start following blogs written by actually autistic writers and listen to what they have to say about all things autism related. 16. Install some speech therapy related apps and/or some occupational therapy related apps on a mobile device. Or search for more specific apps with this awesome Tech Finder from Understood.org. You can find all of our favorite speech and social skills apps here. 17. Make a travel sensory diet bag for on the go. Keep it in the car or in your purse so that it's always handy! 18. Print off these calming strategies cards to help your child self-regulate and learn about emotions. 20. Start keeping track of your child's behavior in a journal. Jot down notes about when meltdowns occur, what triggered the meltdown, what your child seeks or avoids in terms of sensory input, and anything else that may be important to share when your child is getting their assessment done. I love these free printable incident questionnaires from Every Star is Different. These are great ideas for sensory kids, too. I love the swings idea. My daughter seeks out vestibular activities, and swings are where she spends most of her summer days. I never thought to bring them indoors but she would love that for the winter! Our winters are long so that's why we installed a swing in our basement in the first place, but my boys spend hours in them.